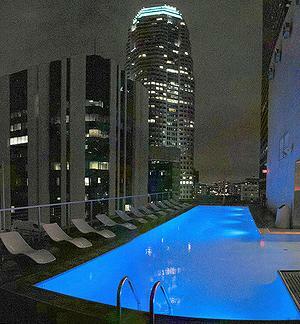 LOS ANGELES, California, March 26, 2010 (ENS) – The corporate operator of the Standard Hotel in downtown Los Angeles has agreed to plead guilty to violating federal environmental laws in an incident where a hotel employee poured pool chemicals down a rooftop drain. The chemical dump led to a street closure and several people became ill when fumes filled a nearby subway station. In a plea agreement filed Tuesday in United States District Court, HotelsAB Downtown Employees LLC, doing business as Standard Hotels, agreed to plead guilty to a misdemeanor charge of negligent discharge of pollutants. In the plea agreement, HotelsAB agreed to pay a criminal fine of $200,000, the maximum penalty under federal law, and to make a $150,000 community service payment. Investigators from the the Federal Bureau of Investigation and the Los Angeles City Fire Department, Hazardous Materials Unit, found that on January 18, 2009 a maintenance employee at the Standard Hotel negligently disposed of chlorine and muriatic acid that were located near the hotel’s rooftop pool. The worker pumped both chemicals into the Standard Hotel’s rooftop storm drain. This mix of chemicals caused gases to form in the storm drain system, and some of those gases were released into a subway station near the hotel at 7th and Figueroa. When authorities arrived at the subway station, they encountered a chemical smell and several victims, including a law enforcement officer, who were sickened by the chemicals. The intersection of 6th and Flower streets in downtown Los Angeles was closed for several hours because of gas escaping from the storm drain system. According to the plea agreement, HotelsAB will make a $150,000 community service payment that will go to the National Fish and Wildlife Fund, which will use the money to fund environmental projects, enforcement efforts, and environmental initiatives that will help preserve and restore the environment and ecosystems. HotelsAB also has agreed to make full restitution to the Los Angeles County Fire Department Health Hazardous Materials Division and the City of Los Angeles Watershed Protection Division for $20,283 in costs incurred in responding to the chemical dump. Officials from the office of the U.S. Attorney for the Central District of California say “in the coming weeks” representatives of the Standard Hotel will be summoned to appear before U.S. District Judge George H. Wu to enter the guilty plea on behalf of the corporation. Popular for its heated rooftop pool and bar, the 12-story Standard Hotel with its 207 guest rooms is located in the former Superior Oil Company Building. It is close to L.A.’s fashion and jewelry districts, the Walt Disney Concert Hall, the Museum of Contemporary Art and Dodgers Stadium.